Catherine McAuley, founder of the Sisters of Mercy and an early 18th century Irishwoman, believed that nothing was more productive of good to society than the careful education of women. Her strength of conviction gave birth to what would become a long line of women's secondary and post-secondary schools around the globe. Mother Mary Leo Gallagher, another Sister of Mercy, carried on the tradition and opened the doors of College of Saint Mary in 1923. In the old Continental Hotel at 15th and Castelar Streets, the work began. In November 1950, the Sisters purchased 80 acres of land next to a dirt road named 72nd Street and what would then become Mercy Road. A $3 million construction project began in March 1953 and by May 1955, College of Saint Mary was a reality. By 1958, College of Saint Mary had become a four-year fully-accredited college. Today, the College continues its affiliation with the Sisters of Mercy and is proud of its tradition of women leading the way. College of Saint Mary – educating leaders since 1923. 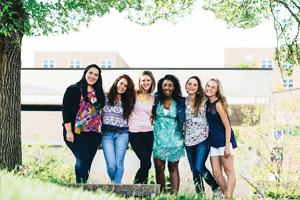 Founded for women by the Sisters of Mercy, CSM is a Catholic university that provides access to affordable education. CSM fosters potential and leadership through academic excellence, scholarship and lifelong learning. The University offers undergraduate and graduate degrees in many of today’s in-demand fields, including physician’s assistant studies, occupational therapy, nursing, science, education, business and legal studies. CSM offers its student body an enriching collegiate experience that includes competitive athletics and a wide range of fine arts opportunities. Located in the heart of Omaha, home of four Fortune 500 companies, CSM’s 40-acre campus is adjacent to Aksarben Village’s vibrant and bustling retail and entertainment space, as well as the new Baxter Arena. CSM is minutes from world-class attractions such as the Henry Doorly Zoo and Aquarium, Joslyn Art Museum, Lauritzen Gardens and CenturyLink Center Omaha.